During the Weekend I only slept 5 hours, had more fun than I had in ages and drank too much jolt. 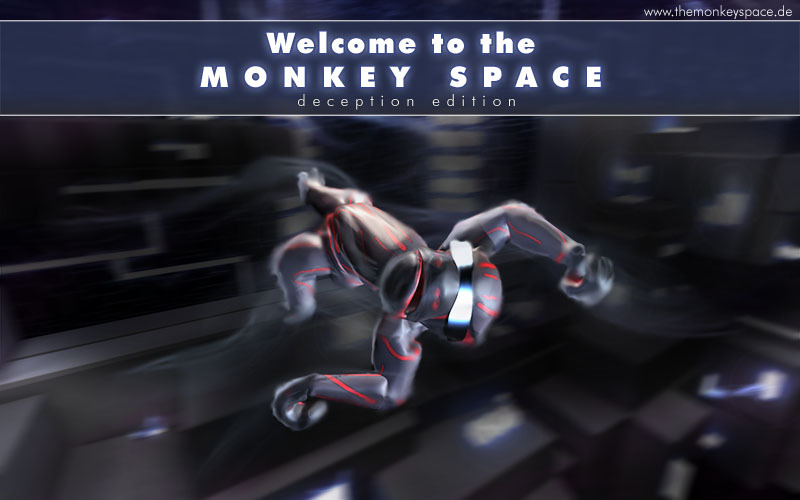 The cause and result of this is The Monkey Space: Deception Edition! It was created by 3 Coders, 3 Artists and 1 Game Designer / Project Manager, who proved to be the awesomest team ever. We laughed hard, almost all the time, If the game that came out of this is only half as much fun as we had making it, it will be the game of the century! you can download the game and test it on the site http://www.themonkeyspace.de . There's even a release with source and it's all for free! Even though we had only 48hours, we did voice acting, intro video, cutscenes, awesome glow, and 2 levels! Creating this has made me remember what game development is all about and why I enjoy it so much. Anyway, we thought the result was so excellent we decided to keep working on it, so we'll hopefully meet on Saturday and plan that.